Memorial Day Monday was not the hoped-for sunny day here in NYC, and the grey sky with threat of rain lent itself to indoor activities like Museum visits! 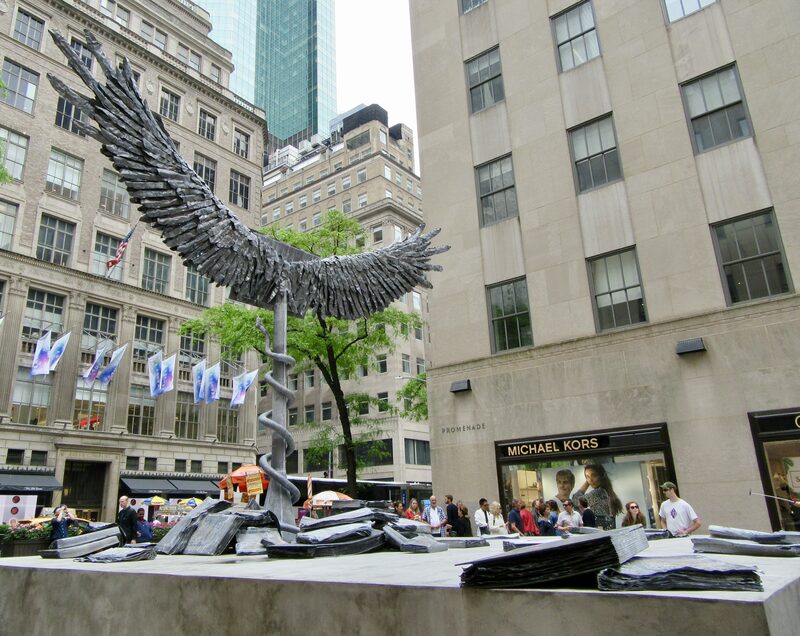 Thus, I was inspired to head out to the Museum of Modern Art, followed by a short walk downtown to Rockefeller Center to see the new summer public artwork. 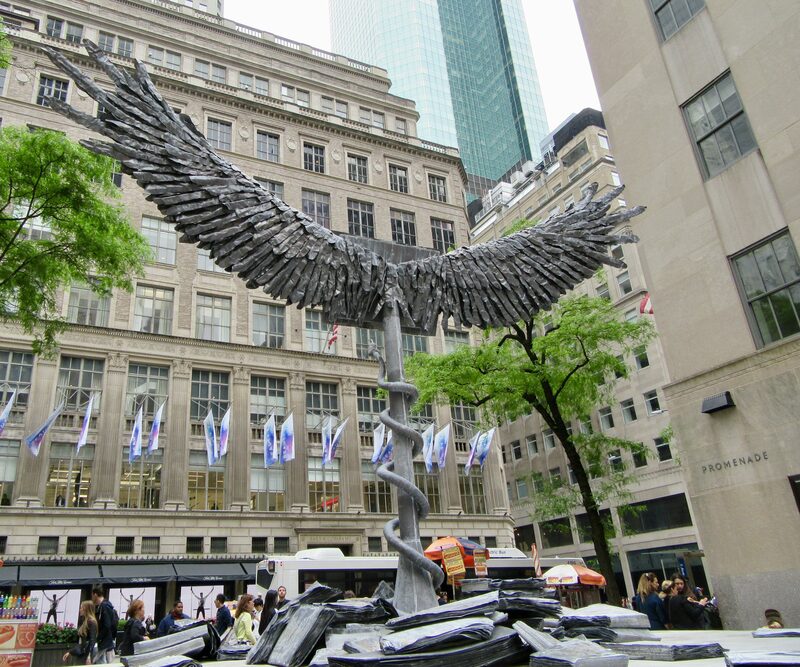 This year’s monumental work is the first site-specific outdoor public sculpture ever to be commissioned for the United States from German artist Anselm Kiefer (b. 1945). 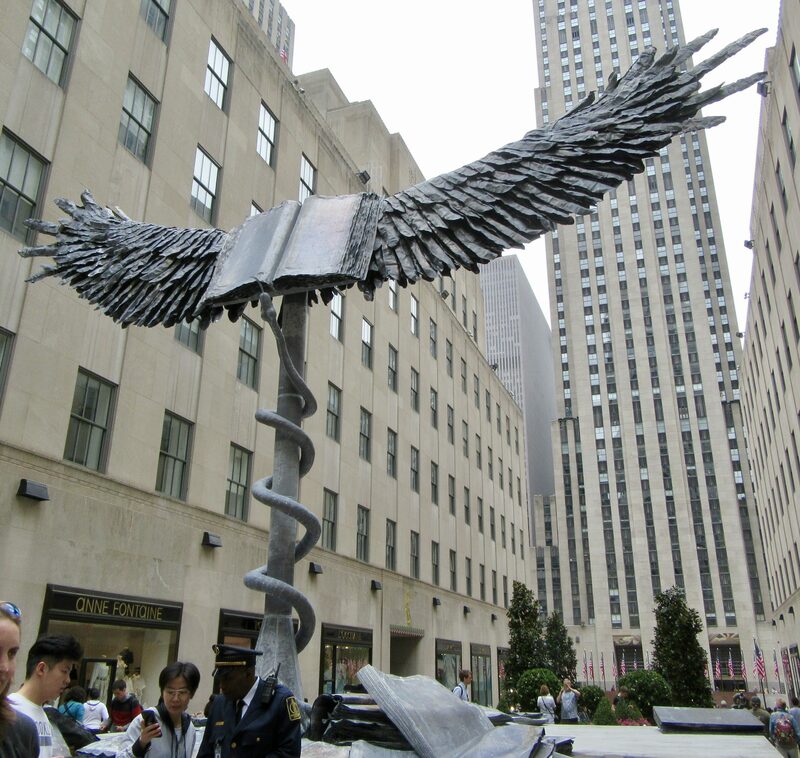 Entitled Uraeus, the work consists of a gigantic open book with eagle’s wings 30 feet in span, both made of lead, on top of a 20-foot-tall lead-clad stainless steel column. 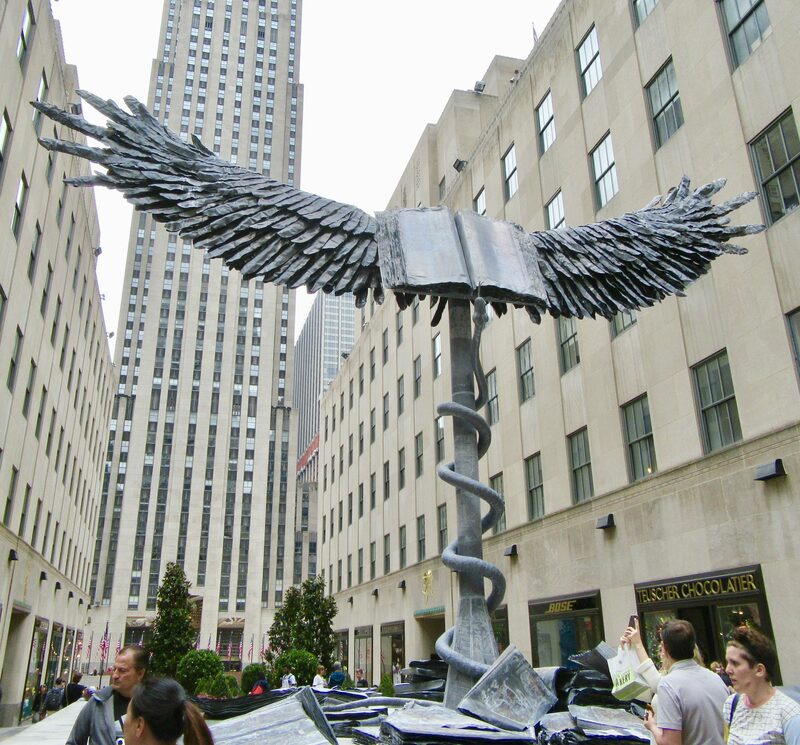 Clustered around the base of the column are further oversize lead books, while a large snake coils up the column (you can see the snake’s head rising up over the bottom edge of the open book). Lead is one of Kiefer’s preferred materials for its soft, fluid properties that are traditionally associated with alchemical transformation. These photos will give you a better view of the statues platform with books scattered about, though it is not easy to get a shot without lots of people coming and going. 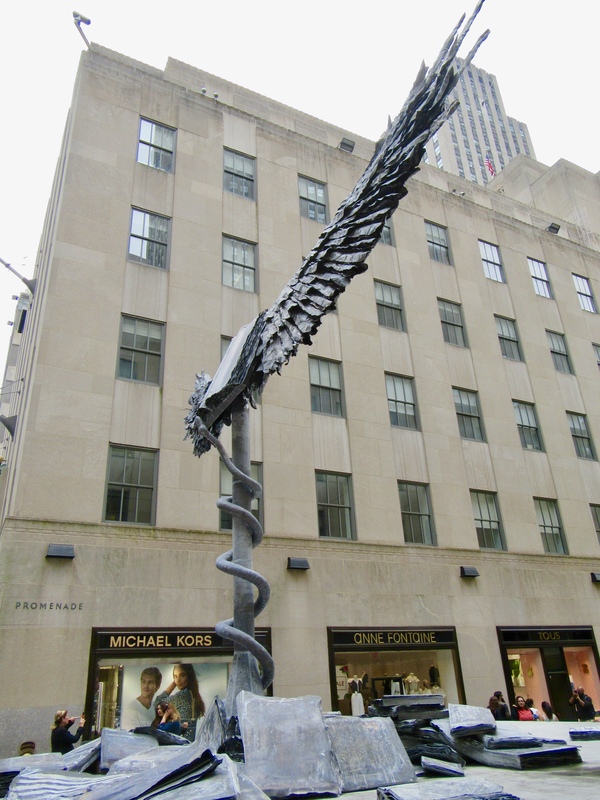 The sculpture’s cryptic title, Uraeus, refers to the erect shape of the Egyptian cobra, associated with the serpent goddess Wadjet and a symbol of power and divine authority. The wings evoke the headdresses and necklaces worn by Egyptian royalty in homage to the vulture goddess Nekhbet. Wadjet and Nekhbet were the guardians of Lower and Upper Egypt, respectively, and following ancient Egypt’s unification, became the joint patrons of the civilization. 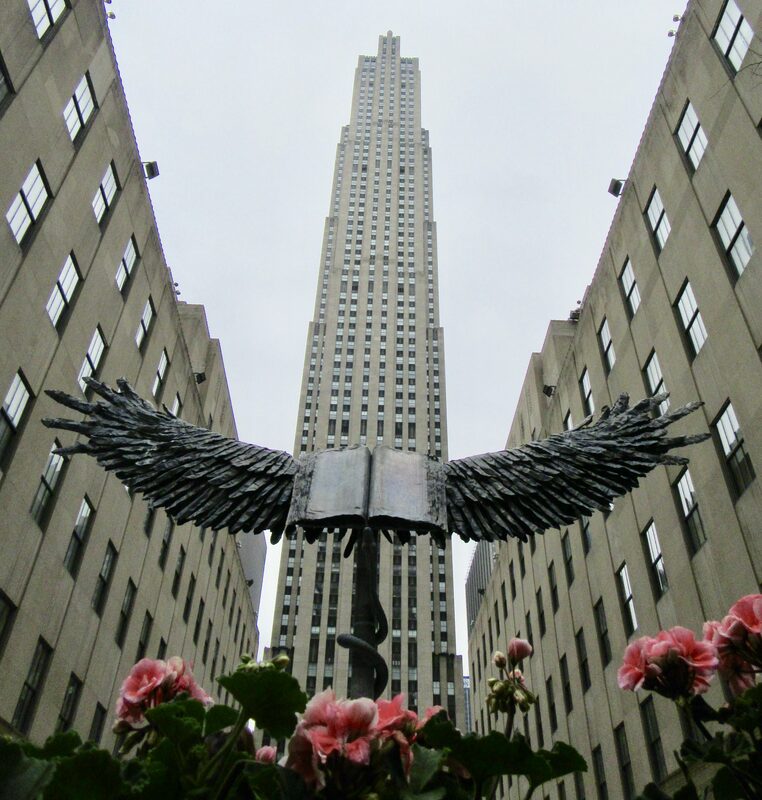 You can read more about the philosophy behind the sculpture at This Link. This is what the piece looks like shot from the rear and facing Fifth Avenue. Uraeus is no Seated Ballerina, but it’s worth checking out if you are in the area! 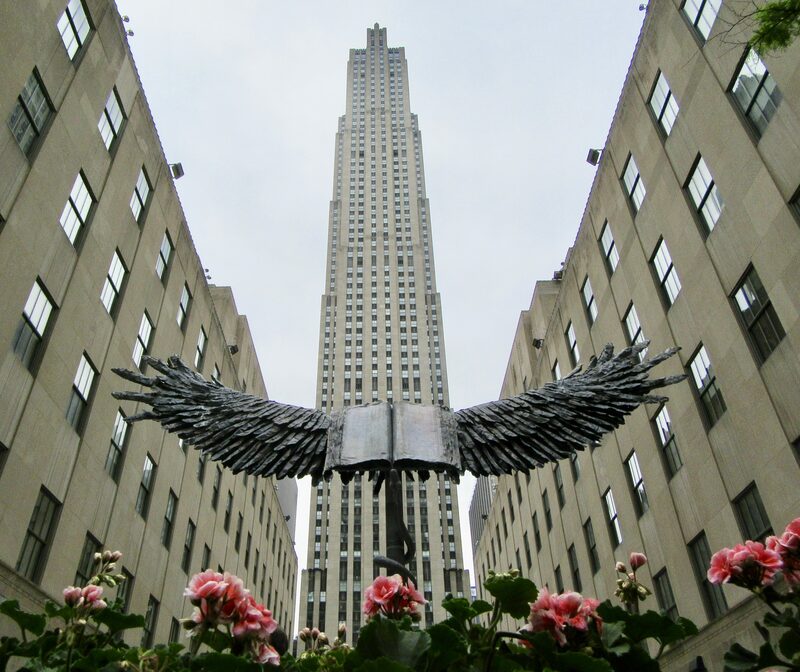 Anselm Kiefer’s Uraeus will be on View Through Jul 22nd, 2018 (expect that tenure to be extended) at the Fifth Avenue entrance to Rockefeller Center’s Channel Gardens, between 49th and 50th Streets, in Midtown Manhattan.